It used to be that every neighborhood had a local butcher who knew you by name, remembered the way you liked your steaks cut, and would take the time to explain to you why one cut of meat was better suited for your needs than another. We now live in a world where service and quality has been largely traded for convenience and speed. 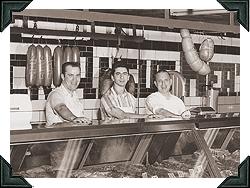 At Weiss Meats, we remain true to the traditional values established by Milton Weiss when he opened up shop in 1948. 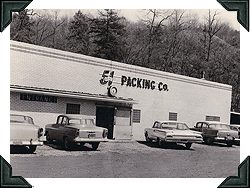 Our retail and wholesale business has grown successfully under the careful management of his sons, Joe and Elliott Weiss and his grandson Aaron Weiss. 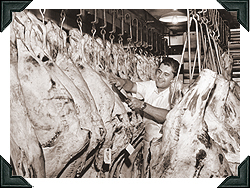 While there are many people who shop for their meats at stores where you can buy your meat, snow tires and toys for the kids all at the same time, aside from a modest offering of grocery items and standard deli selections, we focus on one thing: quality meats. We handpick every product in our store so that you always get only the choicest selections at the best prices possible. Our customers are family, driving in from all over the Tri-state area and campaigning for us with their families and friends, constantly telling them that they have to come in and try us out. Thank you for visiting us on the web. We’re looking forward to seeing you in our store soon!